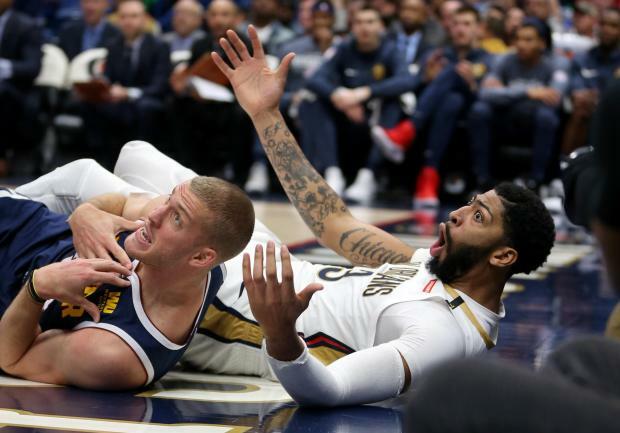 Anthony Davis scored 29 points and Julius Randle came off the bench to add a triple-double as the New Orleans Pelicans routed the San Antonio Spurs 140-126 on Monday night. Davis, who scored a combined 83 points in his previous two games, finished the Monday game six points shy of 10,000 points for his seven-year career. The Pelicans, who improved to 8-1 at home, swept a three-game homestand in which they averaged 131 points. They have won six of their last seven games. Randle finished with 21 points, 14 rebounds and 10 assists. E'Twaun Moore scored 24 points, and Jrue Holiday scored 21 for New Orleans. DeMar DeRozan scored 21 points to lead San Antonio. Bryn Forbes had 20 and former Pelican Dante Cunningham scored 19 for the Spurs, who lost for the sixth time in eight games. Buddy Hield scored 25 points, hitting 3-pointers on three consecutive possessions late in the fourth quarter, to help lift Sacramento past visiting Oklahoma City. Hield's late treys helped the Kings overcome a strong finish from the Thunder's Russell Westbrook, who scored 13 of his game-high 29 points in the fourth quarter. Westbrook, who missed six consecutive games because of a sprained ankle and the birth of twin daughters over the weekend, also had 13 rebounds and seven assists. Iman Shumpert scored 23 points for the Kings, all in the first half. Bogdan Bogdanovic scored 16 points, and Marvin Bagley III had 15 points and 13 rebounds for Sacramento. Paul George added 27 points for Oklahoma City. Giannis Antetokounmpo finished with 29 points, 12 rebounds and six assists to lead host Milwaukee past Denver. Eric Bledsoe added 23 points on 8-of-10 shooting, and Malcolm Brogdon and Khris Middleton added 13 points apiece for the Bucks, who have won consecutive games for the first time since a 7-0 start. Nikola Jokic scored 20 points and Jamal Murray had 17 points, eight rebounds and nine assists for the Nuggets. Kemba Walker scored 43 points, and host Charlotte rallied from a 10-point deficit in the fourth quarter to beat Boston. Walker scored 21 of his points in the fourth quarter, singlehandedly leading the comeback until Tony Parker hit two clutch baskets in the final two minutes. Walker's 3-pointer with 33.3 seconds left gave the Hornets a six-point lead and all but settled the outcome. In the process, Walker reclaimed his spot as the league's leading scorer. He came into the night averaging 28.7 points per game, behind LeBron James' 28.8, but now holds a slight edge over James. Kyrie Irving led the Celtics with 27 points and 11 assists. Joel Embiid scored 33 points and grabbed 17 rebounds to lead host Philadelphia past Phoenix. It was Embiid's 11th game this season with at least 30 points and 10 rebounds. The Sixers improved to 9-0 at home and secured their 19th straight home win dating to last season. This is their longest home winning streak since tallying 24 straight from Nov. 27, 1982, to March 23, 1983. Ben Simmons added 19 points, 11 rebounds and nine assists for the Sixers, who have won three in a row. Devin Booker led the Suns with 37 points, while TJ Warren added 21 and rookie DeAndre Ayton chipped in with 17. Bojan Bogdanovic scored 21 points and Domantas Sabonis just missed recording a triple-double as host Indiana cruised past Utah. Sabonis finished with 19 points, nine rebounds and a career-high nine assists in 26 minutes off the bench. The win was the third straight for the Pacers, who completed a sweep of a three-game homestand that also included games against Miami and Atlanta. The Pacers were playing without leading scorer Victor Oladipo, who missed his first game of the season because of a sore right knee. Ricky Rubio led the Jazz with 28 points, six assists and three steals. Mike Conley scored a game-high 28 points, which included seven 3-pointers, as host Memphis cooled off Dallas. The Grizzlies won for the seventh time in eight home games, while Dallas saw its season-best, four-game winning streak come to an end while losing for the seventh time in eight road games. The Mavericks' 88 points marked a season low. Conley's seventh 3-pointer with 4:26 to go in the game came on the heels of Garrett Temple's second 3-pointer for a 90-84 lead. Marc Gasol, who finished with 17 points, 15 rebounds, four assists and four blocks, then splashed a jumper to give Memphis the largest lead of the game, 92-84 with 3:01 to go. Tobias Harris and Montrezl Harrell combined to score 49 points and lead Los Angeles to its fifth straight win at the expense of host Atlanta. Harris scored 24 points and was 4-for-8 on 3-point attempts while adding eight rebounds and two blocks. Harrell came off the bench to score 25 points and made a career-best 15 free throws while adding 11 rebounds, five steals and two blocks. Atlanta lost its eighth straight game and the 12th of its last 13. The defeat came despite 25 points and a career-high 17 assists from rookie Trae Young. Young broke out of a three-game scoring slump that saw him limited to single digits, including only four points in a Nov. 13 loss at Golden State. He scored 19 in the first half Monday to pace the Hawks to a 64-61 halftime lead. Andre Drummond had 23 points, 16 rebounds and three blocks to boost host Detroit past Cleveland. Blake Griffin had 21 points, 12 rebounds and five assists, and Reggie Bullock contributed 21 points and four assists for the Pistons, who led by as many as 30 points. Reggie Jackson added 13 points, and Ish Smith tossed in 11 off the bench. The Cavaliers had six players in double figures, led by rookie Collin Sexton's 18 points and four assists. Jordan Clarkson had 16 points, four rebounds and four assists off the bench.